The Whisky Waffle boys are known to enjoy a glass of their local drop from time to time, although usually they know precisely what they are drinking! Hellyers Road create a range of different expressions that all have their own unique personalities that emerge from the overall Hellyers Road character. Nick and Ted are fairly confident at telling the drops apart when the bottles are sitting in front of them, but how well would they fare if this pretty big hint was removed? Welcome to the Whisky Waffle Hellyers Road Blind Tasting Challenge (WWHRBTC)! In the red corner: Nick ‘The Nose’ Turner and Ted ‘The Tongue’ Matthews, whisky critics of questionable renown. 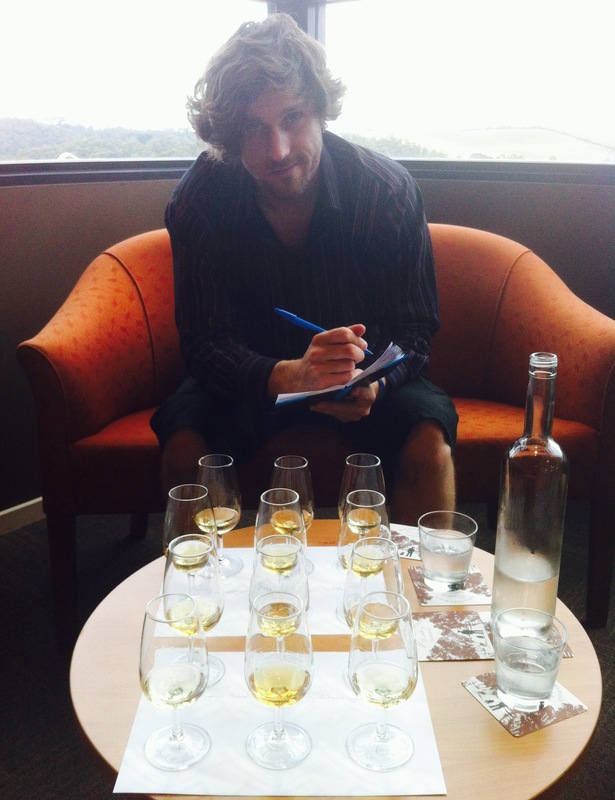 The six drams were presented to us in a random order by the lovely Brea, numbered 1-6. A quick eyeball revealed that while all were the expected amber colour (no greens or blues here), #1 and #5 were clearly darker than the others, while #4 was exceptionally light. Could #4 have the chardonnay tinted hue of the Original? Could the darkness of #1 or #5 suggest months spent in a Tamar Valley Pinot Noir barrel? A prolonged nose indicated that while all smelled like whisky (no sneaky tea here), #3 packed a peaty punch. #1 and #2 both had classier bouquets, possibly hinting at more time spent in oak, whereas #4 had a rawer edge to it. Our suspicions narrowed. Hold on… was that a faint whiff of peat from #6? Mmmmmm… whisky. A good start. Our peat detectors were turned up to ‘high’ for #6, and we were confident that we had a match, but they overloaded when we tasted the roar of smoke in #3. We decided that we had comfortably narrowed down the Lightly Peated and the Peated. #4 matched our previous assessment, with light herbal notes and something of a rough edge. We agreed that we had found the Original. Here’s where the debate started. #1 and #2 were both exceptionally good, but each had their individual strengths and points of interest, causing much to-ing and fro-ing and scribbling outs. Eventually we made the decision that the full bodied character of #1 indicated the 10yo, whereas the the noticeable smoothness of #2 suggested the 12yo. The odd one out in flavour was #5, which seemed fitting for the drop that had the most unusual ageing process. We invited Brea back to announce the results, and waited with bated breath as she revealed the true order. We were told straight away that we were correct with the Lightly Peated and the Peated, as with the Original and the Pinot Noir Finish. That just left the 10yo and the 12yo. Could we make it a clean sweep, validating hours spent waffling? Ahhhhh… so close, thwarted by a mere two years! We had stumbled at the last hurdle by mixing up the 10yo and the 12yo. In fairness to us, they were the hardest two to distinguish between. Our valiant attempt ended honourable defeat. So near, yet so far. Just wait though, in another three years they’ll bring out the 15yo! If anyone finds themselves in Burnie and fancies a crack at beating our score, you can purchase the range of drams for an exceptional price. Just make sure you’re not driving. Let us know how you fare!